1.) Supply your feed(s) on Feedconverter.com/convert. 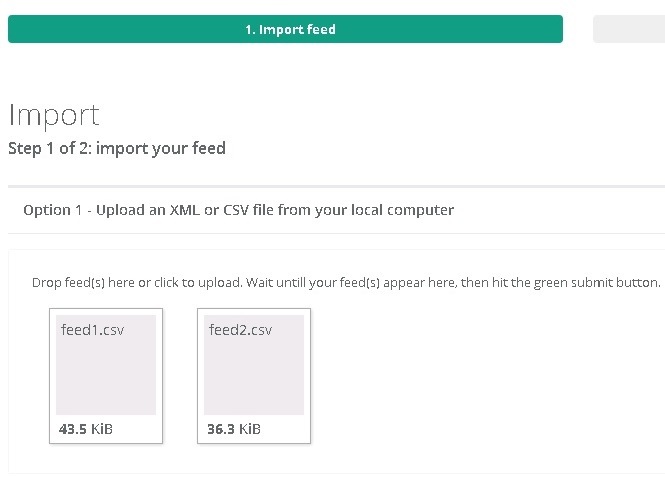 You can supply us your feed on Feedconverter.com/convert in 3 different ways. You need to choose 1 of those 3. Your feed needs to be in .csv of .xml format. Choose this option if your feed resides on your pc. Choose this option if your feed resides on a web server ( and can be viewed in a web browser without the need for a username or password ). You can us this option, if you can copy and paste your feed. Click the green Submit button, next to the option you choosed. Right from "Convert to:" choose your desired conversion. Click the View or Download button, to get your converted feed. Click on the green submit button. Ready! Click the Download button to get your feed. How to add extra data to my feed? Go to Feedconverter.com/convert. Import your feed. On bottom of page, see "Optional: add additional data". See image below. For example, if you want to add field "TimeToShip", enter "TimeToShip" at Name, and enter the value( like "2 days" ) in inputfield "Value". Ready! Now all record in your field have a "TimeToShip". I seems i can not convert my feed to the feedtype i want. How to fix that? You can request us to add the feedtype you desire here.